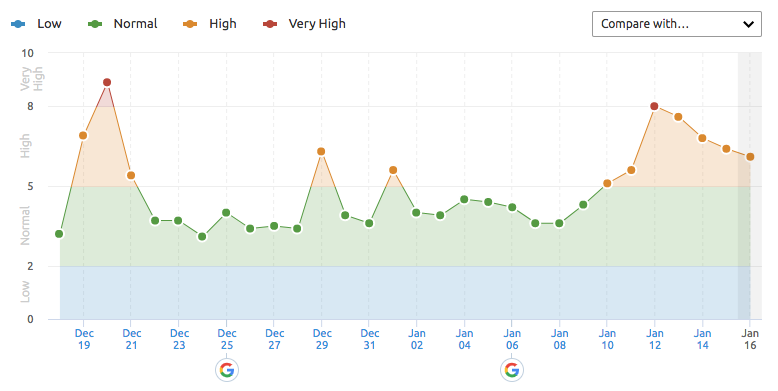 I am starting to see some early chatter within the webmaster and SEO community around a Google search algorithm update. It is pretty early but the ongoing WebmasterWorld thread has some chatter as of yesterday afternoon through today. It might be some more tweaks from what we saw last week, potentially related to the Maccabees updates, which we felt targeted keyword permutations as well as Fred like stuff and even hit some celebrity sites. Google did somewhat confirm those updates. I'm seeing lots of movement in my niche (and not in a good way for me personally!) However, I've spent far too much time watching (obsessing) over the SERPS over the past ten years, and there's no point trying to second guess what Google wants so I've given up worrying, and will just go with the flow! Seeing a big dip in both ranking and traffic today. Feels like a dialing up of whatever happening in mid December where we also got nailed. Definitely seeing a bit of an increase today - not much but noticeable. We were worst affected on December 12th and it's been steadily poor since then. Anyone seeing more changes today? We saw some good lifts after an initial lull. Automotive, UK. The chatter is not massive, but it may be the start of something or it may be a test or nothing. This is all speculative as I always say with my unconfirmed Google update posts. Are you noticing any changes to your Google rankings and organic referral traffic?